In February 2008, Dana Walrath's mother, Alice, was kicked out of her New York City apartment for the second time in six months. The reason: behaviors driven by her Alzheimer's disease. Unable to find her mother another place to live, Walrath moved Alice to Vermont to live in her family's Underhill farmhouse. But after three years, Alice's dementia became too much for Walrath to handle, and she had to move her mom into a locked memory-care unit. Alice's experience there, Walrath recalled, "was a disaster." The dementia made her hungry all the time, but the unit's rigid rules permitted her to eat only during mealtimes, "and the poor woman just went into a panic." Alice was then transferred to a psychiatric unit, where her caregivers told Walrath that her mother could never live in a group setting again. A second memory-care unit worked OK — for a time. But as Alice's agitation worsened, she eventually required more attention than that facility could provide. "I thought it was just the disease," said Walrath. "But in retrospect, she was trying to say, 'Get me out of here!'" Walrath was no novice to Alzheimer's numerous challenges. A writer, artist and medical anthropologist, she taught at the University of Vermont Larner College of Medicine, where she's still on the family medicine faculty. Her 2016 graphic memoir, Aliceheimer's: Alzheimer's Through the Looking Glass, chronicles her three years of caring for her mother at home. Walrath now travels internationally giving talks and studying eldercare and dementia in other cultures. During one talk about Aliceheimer's at UVM, Walrath met Dee DeLuca, cofounder and executive director of the Living Well Group. 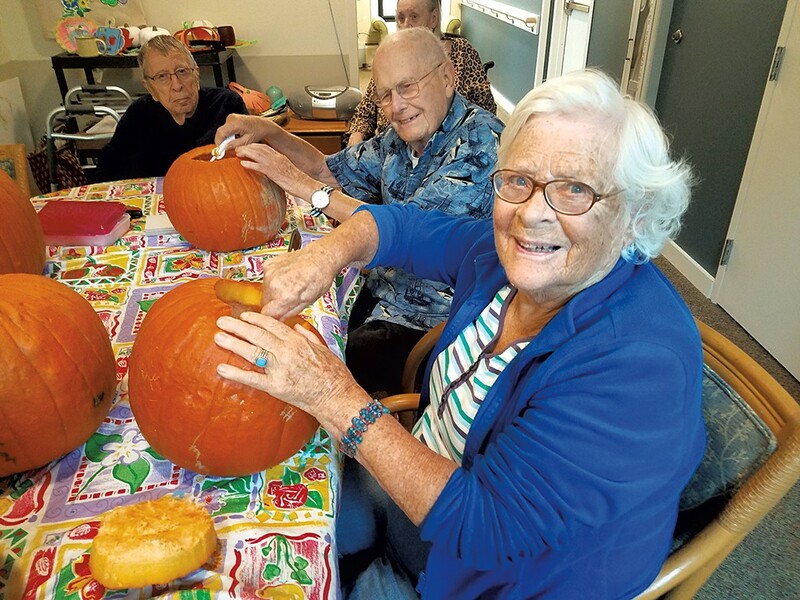 The Burlington-based nonprofit runs three residential-care assisted-living homes in Vermont — in Bristol, Burlington and Montpelier — all of which subscribe to a holistic and inclusive model of eldercare. There, residents and staff eat meals together. Most of the food comes from local organic farms, the Vermont Fresh Network and the homes' own vegetable gardens, which the residents tend. All of the elders are encouraged to participate in daily social activities to the best of their abilities. And, importantly, those with dementia aren't kept in separate lockdown units but are integrated into the family-style setting with other residents. Intrigued by their approach, in October 2014 Walrath moved her mother into the Ethan Allen Residence, Living Well's 39-bed home in Burlington's New North End, which opened in 2009. Almost immediately, Alice's condition improved. Because the staff encouraged her to interact with others and treated her with love and respect, not fear, Walrath said, Alice's agitation "went way, way, way down." In the process, so did her need for psychoactive meds. "Those were quite incredible years," Walrath recalled during a phone interview last week from Dublin, Ireland, where she's on a one-year fellowship with the Global Brain Health Institute. "When I was traveling, I could always feel completely safe. I knew [Alice] was really loved and in good hands." "We decided to do aging differently," explained Paul Kervick, cofounder and president of Living Well. "When you get older, that's a time when you're not supposed to be dealing with stress." For years, Kervick and his wife, Julie Windsong Kervick, who are both nondenominational ministers, ran the Awakening Sanctuary, a 30-acre retreat in Monkton founded on similar principles of community and sustainability. In 2003, DeLuca, a former UVM nursing student and self-described serial entrepreneur, approached the Kervicks. DeLuca had heard that a residential care home for seniors in Bristol was closing. She asked the Kervicks if they would help her find a solution. So, with financial support from the Vermont Community Loan Fund and Northfield Savings Bank, the Kervicks and DeLuca bought the Bristol facility, located in a 130-year-old Victorian house. The 15-bed Living Well Residence opened in 2004. Its philosophy, according to Kervick, is "whole-person eldercare that honors, respects and elevates each individual while redefining aging in America." Indeed, the approaching "silver tsunami" of retiring baby boomers will soon impel Vermont to redefine its approach to eldercare. According to U.S. Census figures, Vermont's population is the second oldest in the nation and on track to claim the top spot soon. Within 10 years, Vermont will add another 100,000 people to its 60-and-older demographic. The number of Vermonters 85 and older is expected to double by 2030. Many will have cognitive impairments. But, as DeLuca put it, "We can't build the buildings fast enough, and we can't lock everybody up" in memory-care units. Central to Living Well's mission is not to discriminate against residents based on income. About half of their residents are Medicaid recipients; the rest pay through private insurance or personal savings. Prices vary depending upon location, DeLuca said, but a private-pay resident at the Ethan Allen Residence runs about $180 per day. Unlike many assisted-living facilities, however, Living Well doesn't kick residents out if they exhaust their savings and are unable to keep paying their own way. "Our whole goal is to let people age without fear, to be healthy, vital and happy," Kervick said. How does Living Well stay sustainable while serving local, organic food? As Kervick explained, staff and volunteers pickle and can their own food. They bake their own bread and glean from local farms. They negotiate food purchases directly with local farmers, such as one 75-year-old Addison County farmer who raised them a cow to butcher. About 10 years ago, UVM conducted a study that examined every dollar the Living Well Residence spent in its first three years. It found that 90 percent was spent within 10 miles of Bristol. "Our food costs were also two-thirds [that] of everyone else in the industry," Kervick added. "Food is medicine." During a recent tour of the Ethan Allen Residence, a reporter got to see the inclusive, family-like approach in action. Nearly all of the residents were either in the dining room eating lunch together or scattered about in common rooms listening to music, making artwork, chatting or exercising. A few watched TV, but almost none were in their rooms. The more able-bodied residents helped those with diminished abilities, which, as Kervick pointed out, gives them a greater sense of purpose. The bedrooms are neither huge nor luxurious, and many residents double up. In fact, when administrator Mary Mougey first saw the college-dorm-size bedrooms, she was skeptical that the seniors would like them, especially those accustomed to living alone. "But I have to tell you, I've been here six years, and I think we've had roommate problems once, maybe twice," she said. "And, as people's memory fails them, their anxiety level goes up. So having someone else in the room is comforting for them." This arrangement is financially beneficial, too. Mougey pointed out that the state reimburses them half the amount it pays for traditional nursing homes. So for every patient they take in, she added, "We're saving the state a tremendous amount of money." Mougey also noted that if her elders were still living at home, many would be showing up regularly in the emergency room, whereas her residents rarely require hospital visits. Why? "They're not falling, they're eating properly and they're taking their meds," she said. To that last point, one of Living Well's goals is to help residents reduce or even eliminate their need for medications. 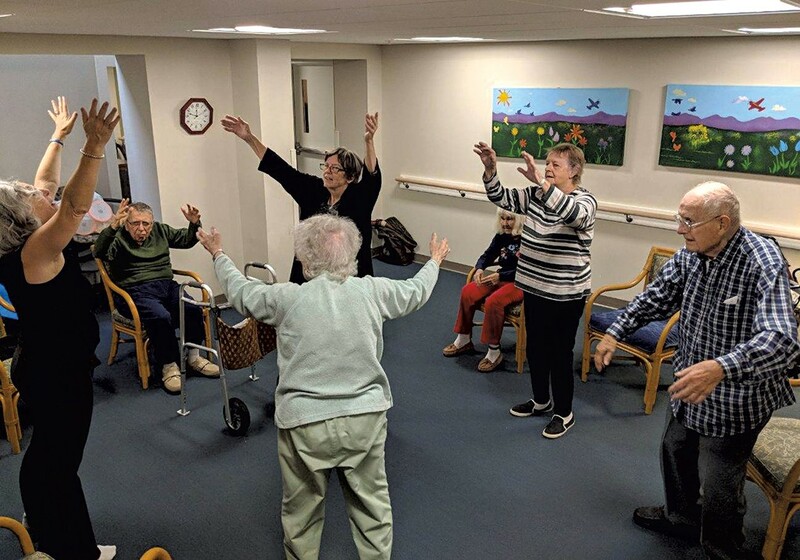 Though most residents have their own physicians, Living Well works with a local naturopath, who uses alternative approaches such as essential oils, music therapy and tai chi to reduce stress, anxiety and depression. Once, Kervick recalled, they had four Medicaid residents using steroidal inhalers, each at a cost of $1,500 per month. When those inhalers stopped being effective, he recalled, their physicians couldn't offer other drug therapies. So Living Well consulted its naturopath, who put them on a homeopathic remedy widely used in Europe. Living Well purchased a four-month supply, enough to serve all four residents, for $60. "And they had better outcomes," he said. Kervick emphasized that Living Well isn't anti-Western medicine. "I'm just against it being the driving focus of how we care for our elders in our communities." Living Well walks the walk in other ways. The nonprofit is governed by a transparent and nonhierarchical model, adopted from the Netherlands, called "dynamic governance." When setting company policies, Kervick explained, everyone in the organization has a voice. It's not consensus rule per se, because not everyone must agree. But Living Well's board of directors includes members of the staff and local communities. In fact, he noted, some of their best policy recommendations have come from care workers and community volunteers. "Aging is a normal part of life. It's not an illness," said Kervick. "We're trying to help shift the consciousness, in Vermont and around the world. We can do this differently as a community. It can be affordable, and it can be high quality." After 15 years, Living Well's model appears to be sustainable. The organization opened its third facility, the 51-bed Heaton Woods Residence, in 2016, in Montpelier's old Heaton Woods Hospital. Living Well now employs more than 100 people and, in the last five years, grew its annual revenues from $500,000 to nearly $6 million. Thus far, Living Well's model has impressed Paul Hill Jr., director of housing and community facilities programs at the Vermont Community Loan Fund, which helped develop all three Living Well residences. "This philosophy that Living Well has is very engaging to the residents, to the families of the residents and to the people in the community. That was really satisfying to us," said Hill. "They've really proved through their performance their adherence to their model and their principles and philosophies. They're just a great organization." Alice Mashoian Walrath turned 84 on November 10, 2017, just a week before she died, surrounded by family. Consistent with its holistic philosophy, Living Well provided hospice services, too, so that Alice didn't have to die in an unfamiliar environment. "We were just surrounded by support and were allowed to have her passage be a very peaceful and personal time," her daughter, Dana Walrath, recalled. Alice's caregivers, several of whom were New Americans, shared traditions from their native cultures, such as opening the window to allow Alice's spirit to depart. And when Walrath told the staff that she wanted to wash her mother's body, no one raised an eyebrow. "It really was like dying at home because Ethan Allen had become very homelike for all of us," Walrath recalled. "Part of why she lived as long as she did was because they loved her to pieces. It was quite amazing." According to Kervick, Living Well has no immediate plan to open new facilities. Instead, the company hopes to serve as consultants to Vermont's other residential care homes — many of which are small mom-and-pop operations — to help them develop the necessary tools and skills to create similar holistic elder homes. 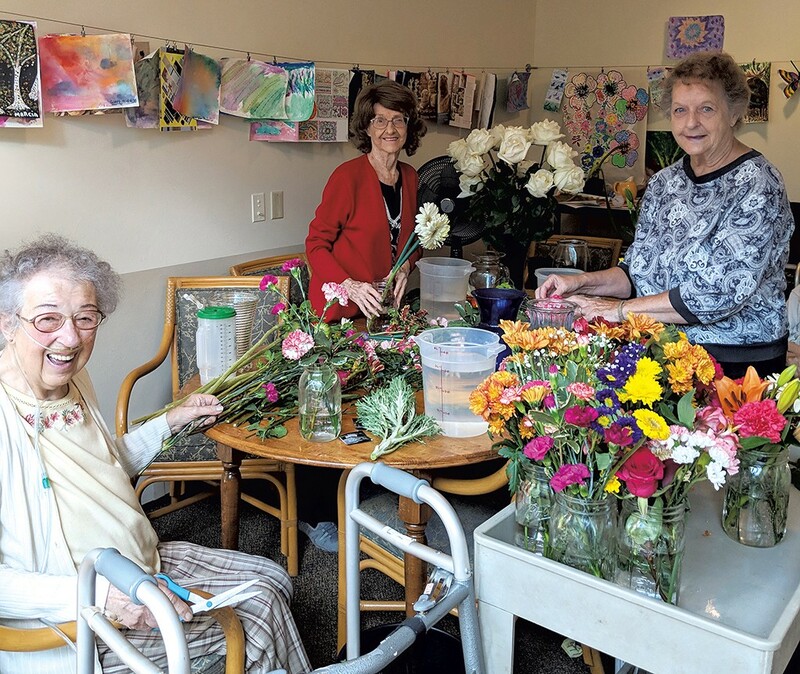 All seniors add tremendous value to their communities, Kervick added, "if we can help all people see aging as a beautiful part of life, rather than as a problem to be solved." The original print version of this article was headlined "Respected Elders | The Living Well Group is redefining aging, dementia and end-of-life care in Vermont"